When I read about Hope for Today, Promises for Tomorrow by Teske Drake, I knew I had to read it. Even though it has been over sixteen years now, and while it has gotten to the point that I will have whole days go by without thinking about my missing child, it doesn't take much for me to snap back to feeling as devastated as I did when I first realized I really had lost my baby. When it happened, I really didn't know anyone who had been through a miscarriage or other infant loss. Or at least I didn't think I did. Suffering a miscarriage is pretty amazing in that I learned about all kinds of losses that others have been through, only I had no clue. I looked for books to read, particularly books from a Christian point of view. Everything I found was about bad stuff in general. I couldn't find anyone who was talking about how to cope when your baby dies. So, reading this blurb from the publisher, I thought, "At last!" And I knew that while this isn't a book I really need NOW, it is a book I want to promote. 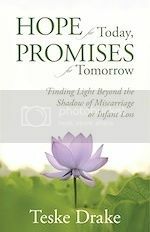 Written from the perspective of one grieving mommy to another, Hope for Today, Promises for Tomorrow is a ten-week study that will encourage and challenge women to delve into a deeper understanding of God's Word. As women engage in biblical teaching, they will learn to embrace God's promises of love, goodness, purpose, comfort, peace, refinement, restoration, hope, and eternity. "Hope for Today" verses peppered throughout each chapter, journaling cues, prayers, and the stories of other women who have experienced loss will help readers move from grieving in silent solitude to living life in the richness of God's love. What did I think? I wish this book had been given to me fifteen or sixteen years ago. Teske Drake is real. She talks about real feelings. For instance, one thing so many people quoted at me was Romans 8:28. You know the one. "...all things work together for good..." I always wondered why people thought that would make me feel better. Not only is our God a good God, but He also works all things for good. All things? Yes. Even the death of a baby. An array of dismal feelings and thoughts bubble to the surface and linger as we trudge through the grief. We question: How could a good God allow such suffering? Why would God take my baby, yet allow another baby to be born into an abusive home? Why does this woman in the supermarket even have children if she only wishes to yell and yank them around? Oh, yeah. I was so there. What I love about this book is that it acknowledges the pain, the grief, the questions. But it also points to something bigger, something greater. There is no condemnation for asking questions like the ones above. Because that was something I found way back when. Lots of guilt for daring to question why God would do something like this to me. This book does give hope. This book talks about God's promises. This is something I will recommend -- or give -- to women I know who lose a baby. In fact, this copy is heading to Kansas tomorrow, to go to a friend of a friend whose baby was just stillborn. I see why this was so hard. I'm very sorry for your loss, even 15 years later. You just don't get over losing a baby, a dream. I have similar feelings about my years of infertility. There was a book, like this one, that encouraged me -- When Empty Arms Become a Heavy Burden. It's a book I have given to many women struggling with infertility. I will remember this book for those times it is needed. There aren't enough books written on this topic that I would recommend. Thank you, Debra. It will be moving on to my friend, in tomorrow's mail.